No sooner had we posted our article on the prospects of future supersonic jets gracing our skies again, and here comes an announcement from Boeing and Aerion of Reno, Nevada. The giant plane maker, Boeing, on Tuesday 05 February 2018 made a significant investment with the experts in supersonic technology, Aerion. 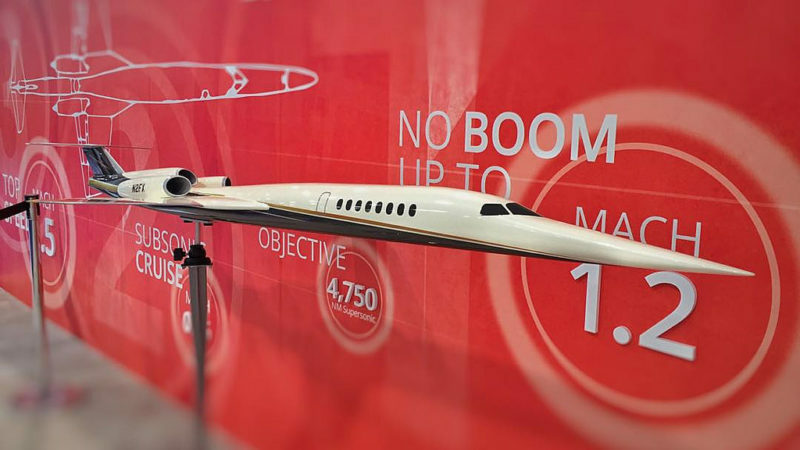 The financials involved have not been disclosed, but suffice to say it will no doubt help out with the US$120 million development costs for the Aerion AS2. It must have been a good deal as Boeing shares touched a record high of US$407.48 after opening above US$400 for the first time ever. As a side note, Aerion and Lockheed Martin were in a Technical Viability partnership from 2017 which lapsed on 01 February 2019 to develop the AS2. Neither party expressed willingness to further this partnership. It almost seems that Boeing was waiting in the wings. So what is the AS2? What is Boeing buying into? The Aerion AS2 is a business jet designed to cut travel times significantly. Here are some specs. Max Speed Mach 1.6, Mach 0.99 over supersonic banned areas. The obvious question is, how will the AS2 suceed where Concorde failed? The restrictions for supersonic flight over land are still very much in place. Because of the sonic boom created by shock waves as the aircraft crosses the sound barrier, these aircraft are not permitted to over fly land for environmental and social reasons. So what has changed? A model of the Aerion AS2 Supersonic Business Jet (SBJ). Note the squareness of the wings, much more like a modern fighter than the classic Concorde delta type wing. There is certainly pressure in the United States on governing bodies to relax the rules around supersonic flight over land. This may or may not be successful. However, in Europe there seems to be no appetite for relaxing these rules, and Europe of course is a huge destination for any business related travel. Relaxing of legislation, therefore, cannot be a condition that supersonic plane makers should count on. The solution has to be in the technology. To minimise the sound shock wave as much as possible, the AS2 is designed with a very long tapered fuselage. This helps to control the length of the wave, thereby lessening the resultant boom. Aerion have developed BOOMLESS CRUISE™, which they say will enable the AS2 to cruise at speeds approaching Mach 1.2 without the sonic boom. This is dependant on temperature and wind. Once the AS2 gains certification Aerion intend to work with authorities in order to gain approval for this cruise capability. There is a third feature in the AS2, in that it can fly just as efficiently at Mach .95 as it can at super sonic speeds. Mach .95 is still significantly faster than current passenger airliners, so with this flexibily, the AS2 certainly has the ability to suceed where Concorde failed. Whilst not as fast as Concorde, the AS2 has the capability of flying anywhere in the world without noise related restrictions. She will still have the ability to shave 3 hours off a trans Atlantic flight as compared to present day airliners, which is significant. The AS2 will come with various cabin configuration options, from standard airliner seating to dual cabins with lounge chairs in one and a meeting table in the other. On the outside, the AS2 is very sleek as mentioned above, with a long tapered fuselage. Aerion have done away with the delta wing of Concorde and gone for a more square wing, similar to modern fighter jets. The wing is very square with sharp angles and very thin. Originally Aerion were leaning toward two 19,000 lb thrust Pratt and Whitney engines, but changed to the present configuration of three 15,000 lb thrust GE Aviation engines. The tri-jet configuration they found offered better take-off performance. It will be great to see supersonic travel coming back into focus. The renewed interest will no doubt lead to technological advances and enable supersonic jets to become the new normal. That, surely, will make air travel much more attractive.